Predictive modelling has proved its effectiveness for landscape analysis at inter-site scales, searching for the hidden rules guiding the most probable placement of settlements. In this paper, we suggest using similar spatial models at smaller intra-site scales, to discover apparent rules in the placement of activity areas within a settlement. In so doing, the most probable placement of social activities can be predicted in terms of the statistical properties of the precise locations where artefacts and ecofacts have been observed. As predictive tools in an intra-site scale, we advocate in this paper the use of spatial interpolation techniques. Through their application to a concrete case study from Bronze Age Central Italy, the advantages and limitations of this approach are also discussed. 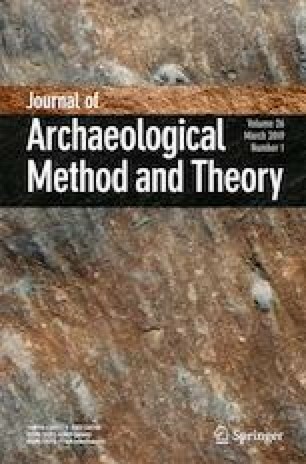 We are grateful to Soprintendenza per i Beni Archeologici del Lazio e dell’Etruria Meridionale, represented in this case by Micaela Angle, who allowed to study the surface layers of the archaeological context analysed in this paper. Furthermore, we are grateful to Beatriz Pino Úria and Antonio Tagliacozzo (Soprintendenza al Museo Nazionale Preistorico Etnografico “L. Pigorini”, Sezione Paleontologia del Quaternario e Archeozoologia), that firstly analysed and subdivided the archeozoological remains. We thank three anonymous reviewers who made relevant suggestions to improve the paper. Any remaining errors or misunderstandings are responsibility of the authors. This work was supported by both the Departament d’Universitats, Recerca i Societat de la Informació of the Generalitat de Catalunya and the Spanish Ministry of Science and Innovation, through the Grant No. HAR2012-31036 and HAR2016-76534-C2-1-R. The first author also acknowledges for her grant from the Program of Formation of Investigators F.I. 2013, managed by AGAUR (Generalitat de Catalunya).